Sakarya Tıp Dergisi / Sakarya Medical J.
Abstract: In 334 (945)the Buwayhids had taken management of almost all state institutions in theirown hands after the conquestof Baghdad. Theauthority of theAbbasid Caliph whose position was reduced to a symbolic status as paid officialin state administration was including only judicial powers and managing thereligious institutions such as the mosque and masjid and the institution ofNiqaba al-Abbasiyin that controlled the court cases related to members of theAbbasid family. However,his jurisdiction was also subjected to intervention in the first years of theBuwayhids’ ruling in Iraq. The article deals with the founder of the IraqiBranch of the Buyid dynasty, amir Muizz al-Dawla’s intervention in jurisdictionof the Abbasid caliph and its influence on public opinion; the events occurredafter this intervention; and as well as, the functioning of the Qadi (or Kazi)Institution and the duties of qadis (judges). Furthermore, the article coversthe information about the functioning of Hisbah institution of that time. Abstract: Agingis a phenomenon which is associated with social, psychological and economicaspects. The Value judgments about senescence and oldster are related to howthey are looked at. Perceptions about aging influence the social position ofthe elders. Statistical distribution of the elders, sociocultural environment,socioeconomic conditions are the factors affecting the formation of valuejudgments related to the elders. The value judgments related to the old age cansometimes stem from prejudices. In the studies related to the aging period, itis seen that the value judgments related to the elderly are handled with threedimensions; positive, negative and mixed. In Turkey, value judgments aboutelderly people are shaped in a religious-traditional frame, but it changesdepending on sociocultural change. In this study, positive and negative valuejudgments about the elderly in Turkey are handled by sociological andsocioeconomical dimension. These values are analyzed in the context of agingtheories, social change and related literature. Abstract: The aim of this research is to determine religious, spiritualand moral effects of religious groups on women. A semi-structuredinterview technique, as one of the qualitative research methods wasused in this study. The research sample included 40 women who affiliateto different religious groups in İstanbul. Four religious groups wereidentified; the sect of menzil, İsmailağa religious community, Süleyman Efendi religiouscommunity and the sect of Rifaî and ten participants were chosen fromeach. According to the results derived from the study, religious groups foundto have a significant effect on their followers in terms of religion,spirituality and morality. The study also demonstrated that obedience to groupshas become more crucial in time and members do not tend to question theirreligious group and practices. Abstract: Hilmi OmarBudda (1894-1952) has played a significant role in the process of developmentand institutionalization of History of Religions in Turkey. 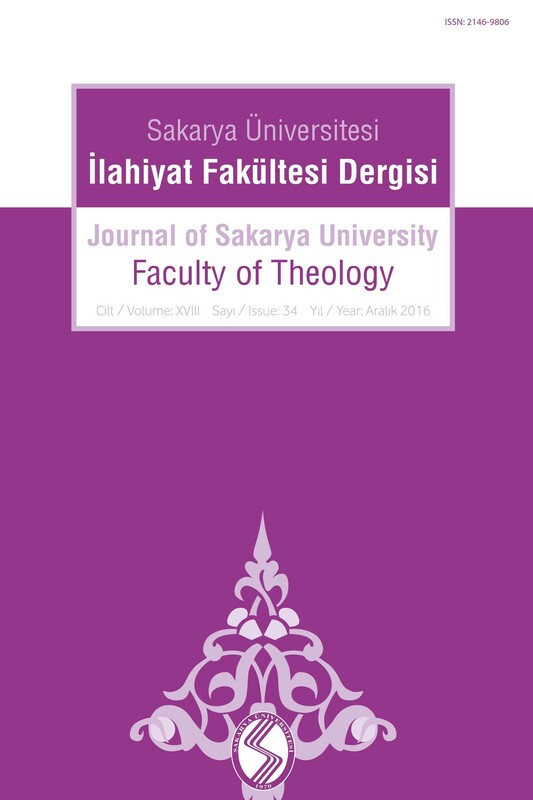 He, who was thefirst academician in the field of History of Religions in Turkey, lectured formany years in Dar’ul-Funûn (Ottoman University) Faculty of Divinity, which wasfound in 1924. Then he worked in department of Institute of Islamic Sciences, whichwas a branch of Istanbul University Faculty of Arts, by pursuing his same positionand career. After that Budda lectured in Ankara University Faculty of Divinity,which was found in 1949, as the first academic person of the department ofHistory of Religions. Budda, who has written many scientific studies and has traineda large number of students during his academic life roughly thirty years, hasfilled a gap in the field of History of Religions in the early years ofrepublic period. This article deals with Budda’s contributions to the Historyof Religions area and his role in the formation of such a discipline. Thisstudy, besides, mentions about Budda’s academic sides by analyzing his scientificwritings composed of books, articles and columns. Abstract: One ofthe most important subjects of Islamic Jurisprudence is the subject of qiyas,and within that there are the cause topics, where most of the disagreementstake place. Various objections against the cause are mentioned, and one of themis the refutation objection, which is connected with such issues as whether ornot the cause is muttarid and the possibility of limitation of the cause. Thepresent work deals with such matters as the circumstances under which the refutation-whichis the name given to the case where there is no hukm despite the existence ofthe cause-invalidates cause, the ways to respond to the refutation objection inorder to reboot that objection, and those responses that are accepted and thoserefuted. Abstract: The main purpose of this research is to examine empirically the relationship between anxiety and religiosity in individuals in adulthood in terms of religious psychology. Therefore, in this study, it is aimed to explain what kind of relationship there is if there is a relationship between anxiety of death and religiosity in adulthood. The universe of our research constitutes adult individuals living in the city center of Istanbul. The sample consisted of 500 adults living in Istanbul, selected by random sampling. The data acquired as a result of the study were analyzed via SSPS 18.0 package software and arithmetic mean, frequency distribution, pearson correlation and t-test were applied. As a result of our study, it was determined that there is a positive relationship between the anxiety of death and the behavior, emotion and cognition dimensions of religiosity and genereal religiosity. That is, as a result of the analyzes made, it was found that as the anxiety level of death increased in adulthood, the level of general religiosity and the behavior, emotion and cognition dimensions of religiosity increased. On the other hand, no relation was found between death anxiety and religious dimension.